With summer in full swing, and many people on holiday, plants in the garden can suffer in the typical dry conditions at this time of year. This may not be an exceptional summer for heat and drought, but even in normal years plants can be affected by dry soil and hot weather. Plants that are lacking water will stop growing, and they may lose leaves. The younger growing tips may die too, reducing even the modest amount of growth made earlier in the season. You may spend summer away from home, or simply not have the time or inclination to water. You may live in a part of the country where water conservation is an issue, or where summer watering restrictions are common, and need xeric plants, as these drought-resistant trees are often called. Whatever the reasons, planting drought-resistant trees and shrubs makes sense. These plants are often beautiful too, so you don’t have to have a garden of cactus bushes to reap the benefits of plants that remain healthy and attractive through the driest and hottest weeks of the year. A classic image of the Italian countryside is the clusters of pencil-thin, evergreens thrusting into the deep blue sky. These Italian Cypress trees have been grown since the time of the ancient Greeks and Romans, and today no Italian villa would be complete without them. The climate from Spain to Greece is well-known as dry, with long, hot summers. These trees are well-adapted to such conditions, and their tough foliage will remain fresh and green throughout the longest dry spells. If you live in warmer areas, from zone 7 to the hottest parts of the country, then this tree can be planted wherever you want a strong vertical accent plant, or lined-up to make a dense and bold hedge. Available in the natural deep-green color, or in the rare blue-green form called Blue Italian Cypress, this tree is sure to attract attention. Two slender fingers on either side of a doorway, or framing an entrance drive, scattered in clusters across a large lawn, or clipped into a wall of rich green – no matter how you use it, this is one drought-resistant plant you are sure to love. If the Italian Cypress is too narrow, or you want a truly blue evergreen, then the Arizona Cypress has to be your number one choice. Renowned for its resistance to heat and dryness, and even sold simply as the Drought-resistant Evergreen, this tree, which really does come from Arizona, is even tougher than its Italian relative. Known correctly as Cupressus arizonica ‘Carolina Sapphire’, this tree is a special selection of the wild tree that was found in South Carolina, among some seedlings. The foliage is much finer and the color is a brilliant steel-blue, creating a stand-out specimen, or striking hedge. Since it grows wild throughout Mexico and the south-west, this tree is no stranger to drought, heat and then more drought. 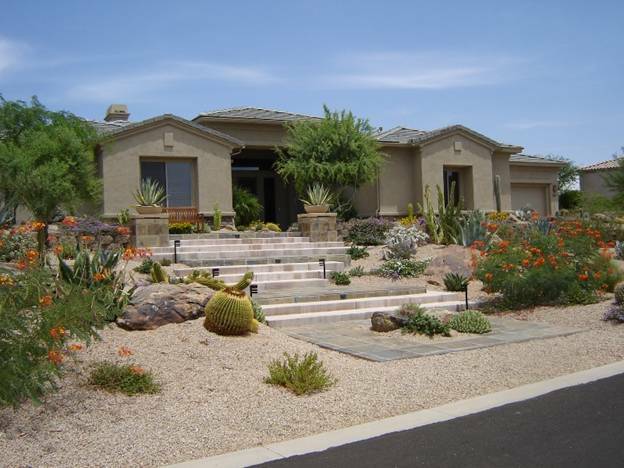 If you garden in areas with watering restrictions, where your plants will have to survive on their own, with no help from you, then the Arizona Cypress is your friend. If you need some screening, or a clipped hedge, it will grow to 40 feet tall if you need that kind of height, or clip to any height at all, from just a few feet to a towering barrier. Once established, you really will not need to water, even after weeks and weeks of dryness. For toughness and resistance to the hottest and driest conditions around, this tree cannot be beaten. Not all drought-resistant plants are trees, and although the American Agave can grow to be 25 feet tall when in bloom, it is mostly a much more modest 3 to 5-foot plant. Not a woody plant at all, the Agave is a striking cluster of dramatic leaves rising from a dense center. Each leaf is thick and fleshy, and edged with spines, and the surface is a waxy blue color, creating a striking architectural element in the garden, or when planted in a large pot. If you love modern design, or the traditional colonial architecture of California, then you will love this plant, which has ‘presence’ is spades. You may need to wait a while to see the dramatic flowering, when a single stem thrusts up as much as 25 feet into the sky, carrying hundreds of creamy-white flowers. Also called the century plant, it doesn’t actually take that many years to flower, but the plant needs to be fully mature before it happens. Until then, enjoy the bold, blue leaves, and don’t bother too much with the watering can. A true desert plant, the Blue American Agave will live for years in dry soil, putting on bursts of growth when a little water is available. If you like ‘different’, then this is the drought-resistant choice for you garden. Not all drought-resistant plants have tight needle-foliage, or look like cacti. When you first see the Wax Myrtle, you see an attractive bush, with regular-looking glossy leaves in a rich green color. They may feel a little leathery, but otherwise you would never suspect that this plant will thrive in pure sand, and resist ocean spray as well. That glossy look comes from a thick coating that retains moisture inside the leaves, and protects them from salt too. The ‘wax’ part of the name comes from the clusters of small, blue-gray berries that form in the fall. Perfect for the holiday season, you can make your own bayberry candles, by boiling these berries in water and collecting the wax that is released. Planted as a bushy specimen, or as a screen against wind and salt-drift, you will love the Wax Myrtle for its drought-resistance and over-all toughness in the most difficult locations. We don’t usually associate colorful blossoms with drought conditions, but the Crape Myrtle, available in many sizes and colors, certainly proves that dryness and flowers can go together. In fact, shade and too much water will reduce flowering in this tough shrub or small tree, which is ideal for bringing vibrant color to hot and dry gardens. Although all these plants are very drought resistant, they still need some attention during the early years of growing. For the first season or two after planting, regular watering will encourage deep rooting, and establish your new plants well, so that they will be fully drought-resistant in the years to come.